Team culture is intrinsic to the development of visitor attractions, where so many different disciplines, needs and requirements converge to turn out a successful project, and where projects tend to be unique. Design, master planning, project management, production and construction – and meeting the challenges encountered along the way – are all team endeavors. It’s therefore no surprise to find that team culture is basic to the company culture of PGAV Destinations, a seasoned and highly successful, highly creative firm specializing in the planning and design of destination attractions. Konzen represents the second generation of ownership at the company. As a graduate of Washington University in St. Louis – where PGAV Destinations is based – he joined the firm in 1986, and gained his first theme park experience on projects for Universal Studios. In January 2010, he and the late Jim Moorkamp (who passed away in 2013) took over leadership of the Destinations group. Konzen has set programs in place to continue to build PGAV’s leadership team and develop its staff. A word often on Konzen’s lips is “empathy.” Empathy is germane to designing great guest experiences; according to cultural anthropology, empathy is a core element of being human. Empathy is also among the basic tenets of emotional intelligence, alongside adaptability, achievement orientation, mentoring, teamwork and inspirational leadership. And empathy works: this key value espoused by Konzen and persistently nurtured within his organization has helped foster continued creativity, innovation and success. PGAV Destinations boasts an international portfolio of work that reflects boldness and excellence in master planning, exhibit design, attraction design and environmental storytelling for theme parks, zoos, aquariums, resorts, brand destinations and museums. 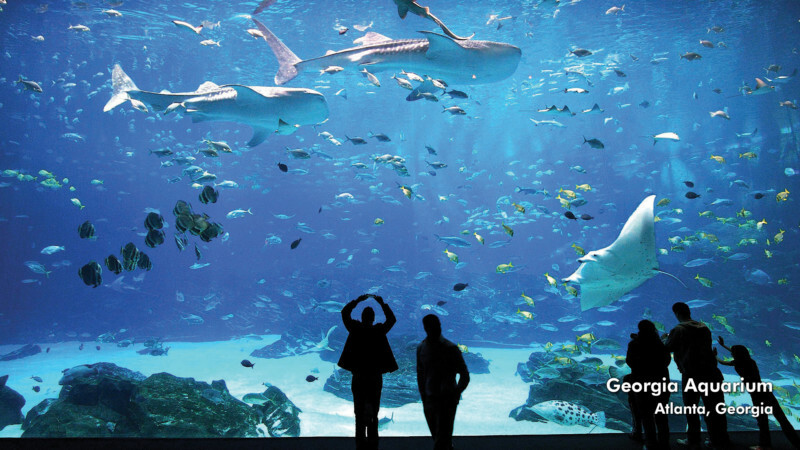 Fun fact: PGAV Destinations has twice designed the world’s largest aquarium. The team culture dynamic helps PGAV Destinations retain a leading position in the industry. It is a good fit with market needs, it enables the company to produce and deliver a great product, and it makes PGAV a rewarding and satisfying place to work. When a client contracts PGAV for a project, they are in fact contracting a proven, experienced, versatile team. Writing in the Wall Street Journal about hiring practices, Dr. Sydney Finkelstein, director of the Tuck Center for Leadership at Dartmouth College, outlined a principle that can be readily applied: “… employers who hire preformed teams can feel confident that [they] will work well together. After all, they already have. Managers have hard evidence that the team has the right mix of personalities and skills to succeed, in the form of the team’s performance record …” (“Why companies should hire teams, not individuals,” Oct 2017). 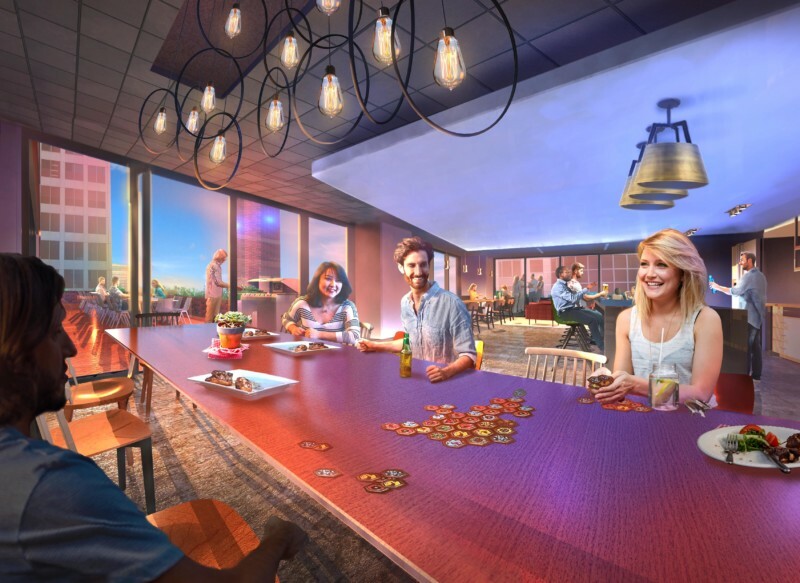 ABOVE: Concept art for the Biergarten and Cafe in PGAV’s reimagined St Louis offices. Courtesy PGAV. PGAV is taking pains to cultivate newer, younger staff, and to pair and team them with senior staff, as was done in the ‘PGAV MOJO project.’ “Our designers create a forum that deepens appreciation for our culture,” said Konzen. Another program, PGAV GO! allots $1,800 annually to each of the firm’s team members toward professional development opportunities. “We want our designers to imagine their own futures and know that we’re here to help empower them to achieve those visions,” said Konzen. The company’s “Spot on Story” program is an internal forum for staff to share historic design stories. 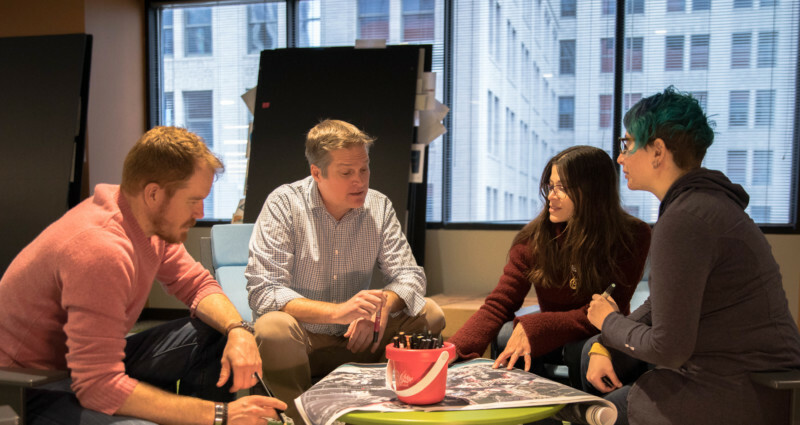 “While a lot of us have been here more than 20 years, we have a good-sized team of fresh, new, creative folks – a really nice blend,” said Tom Owen, VP, senior planner and designer. 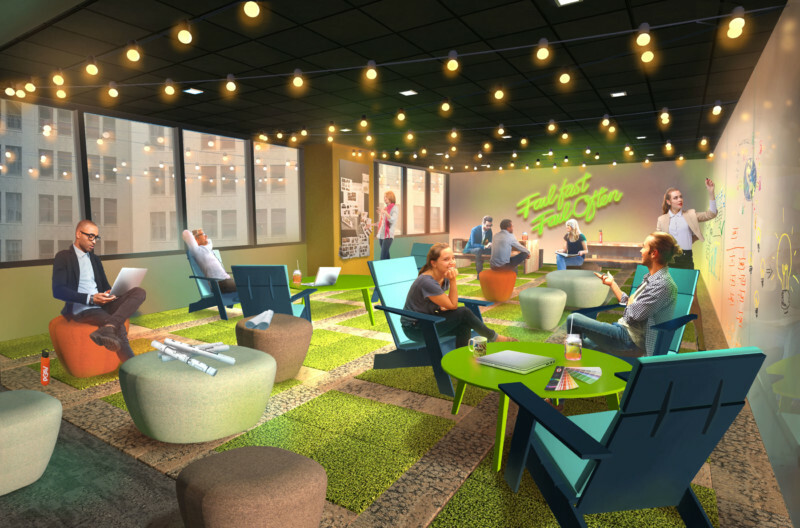 At this writing, PGAV had completed the first phase of a major office expansion and studio overhaul at 200 North Broadway in downtown St. Louis, where the company has been since 1983. The renovation/expansion adds an additional 40% to the space for a total of about 40,000 sq. ft. and includes more areas for hospitality, team collaboration, and unique spaces to work. The design of the expansion makes the most of the opportunity to show what PGAV Destinations is capable of in terms of an aesthetically pleasing, hospitable, contemporary themed environment. Hallmarks are the big, open floor plan, motorized sitting/standing desks at all workstations, flexibility so that people can move together, group and regroup for proximity to their team members, and conference and breakout spaces that are themed and named after PGAV projects. Spacious windows offer views of nearby, downtown amenities and icons such as the Gateway Arch, Busch Stadium, and the Mississippi River. The decision to remain at 200 North Broadway underlines the company’s deep ties and commitment to St. Louis even while the firm expands its international reach. One notable example of a local tie is St. Louis mayor Lyda Krewson – recently elected, the city’s first female mayor, and the former CFO of PGAV for 33 years. What about the first generation? PGAV was founded by William Peckham, Fred Guyton, George Albers, and Mark Viets. Guyton (St. Louis) and Viets (Kansas City) had the longest tenures leading the practice. Guyton is credited with laying the foundations of the Destinations practice, having secured and worked on the company’s initial projects for Busch Entertainment, the first of which was the Bird Garden at Busch Gardens Tampa. “We’ve been fortunate to have multiple long-term client relationships. 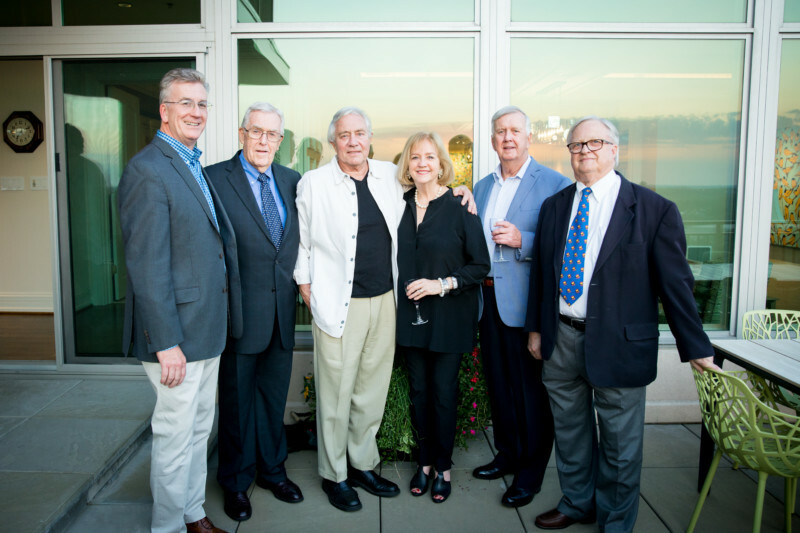 Principal among these is our more than 40-year relationship with SeaWorld. There’s no substitution for developing a project and then watching how it performs over many years,” said Konzen. It was about 20 years ago that PGAV began to leverage its background in theme parks and animal attractions to establish itself in other specialized markets. “We are at our best when we are there at the very beginning and then throughout the process, leading product design, involved in the business strategy; then conceiving, designing and art directing,” said Cross. The attractions industry is a challenging, innovative field. Operators must always be at the top of their game and they demand suppliers are at the top of theirs. A company that can’t evolve and respond won’t survive. PGAV has stood the test for 53 years and shows itself ready to embrace the next 53. During the late 1990s, Mike Konzen developed the strategy, alongside Jim Moorkamp, that led to the company’s modern-day “destinations practice.” The word “Destinology” was coined. 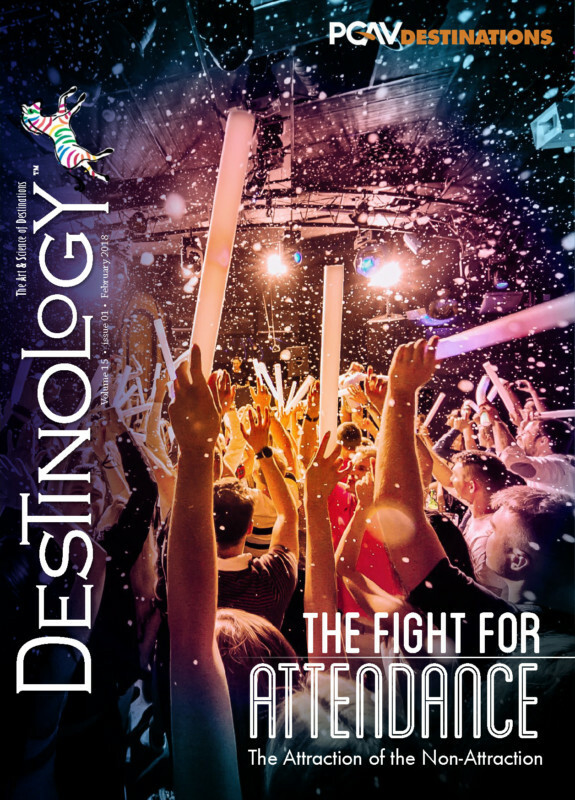 This new branding term, in addition to helping define the company’s practice, became the title of a quarterly PGAV publication, Destinology, with a readership of some 8,000 industry professionals. SeaWorld and Busch Gardens properties are unique in the world of destination attractions. What are some of the qualities that make PGAV a good fit for their unique design needs? PGAV has helped design some of the SeaWorld Parks’ most popular attractions, including Cheetah Hunt at Busch Gardens Tampa Bay and SeaWorld Orlando’s Manta coaster. They have also worked with our teams to enhance the in-park experience with new realms that connect guests to our mission to care for and protect our oceans, such as Explorer’s Reef, our new interactive front of park at SeaWorld San Diego. PGAV shares our goal to provide guests with amazing, unique and fun attractions and rides. We want our guests to be inspired by what they see and learn at the parks, and working with a partner like PGAV helps us deliver on that. Can you talk about the longevity of the relationship with PGAV & what has sustained it? led to a highly collaborative, enthusiastic team with diverse points of view and experience. PGAV can handle all aspects of project development including concept design, scheduling, estimating, and documentation for permitting and construction. Both sides are committed to delivering the best possible experience for our guests. What has been a top result of this collaboration? 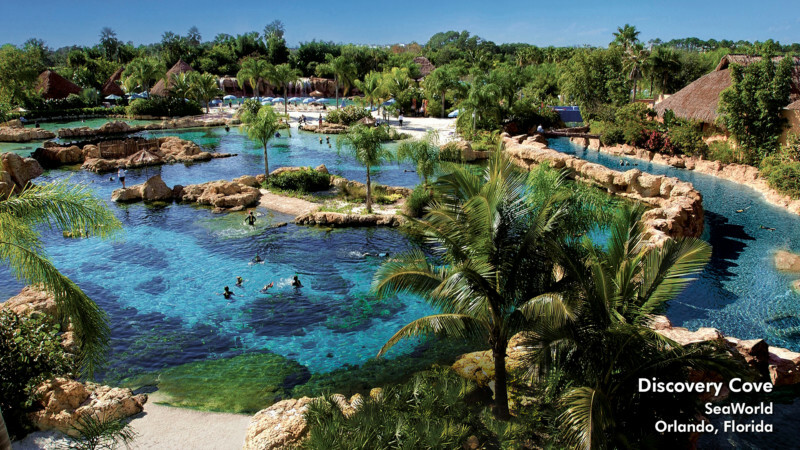 The development and opening of our Discovery Cove project is at the top of the list. An all day, reservation-only park had not been done before, and is still very unique in the industry. Providing our guests a destination like Discovery Cove, with its lush landscaping, beautiful white sand, multiple pools and rivers, and of course, animal interactions was an incredibly gratifying collaborative project. 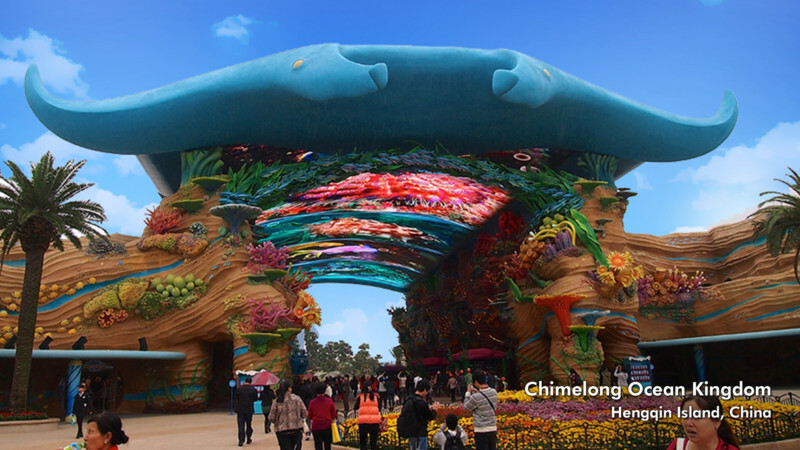 PGAV Destinations served as the master planners, lead design consultant, and lead designers for Chimelong Ocean Kingdom, a world-class, state-of-the-art marine animal theme park that features themed rides, shows, and animal exhibits throughout its eight themed zones. It opened March 2014 in Zhuhai, China. The park was honored by the Themed Entertainment Association (TEA) in 2015 with the prestigious Thea Award. “Mainland China’s explosion of cultural attractions, theme parks and resorts has a radiant new standard-bearer,” wrote the Thea Committee. Annual attendance has steadily increased year over year. Per the TEA/AECOM Theme Index, in 2016 Ocean Kingdom received nearly 8,500,000 visits and was the top-attended theme park in China that year. The park also has earned distinctions in the Guinness Book of World Records (2014), including World’s Largest Aquarium. Chimelong Group Co. Ltd. is a leading tourism, resort and entertainment developer based in Guangzhou, headed by Chairman Su Zhigang. The working relationship between Chimelong and PGAV began in 2009. PGAV had already earned credibility in Asia on a variety of projects for such clients as Samsung Everland (South Korea), Ocean Park Hong Kong and the Museum of Qin Terra-cotta Warriors and Horses in Xi’an, China. PGAV is currently underway on a new project near the Szechuan province; more details are expected soon. Two landmark projects for PGAV Destinations were Georgia Aquarium in Atlanta (open since 2005) on which PGAV was lead exhibit designer, and Space Shuttle Atlantis® at Kennedy Space Center Visitor Complex in Cape Canaveral, FL (open since 2013), on which PGAV was principal storytelling and design firm. Both were celebrated within the industry as pioneering achievements. Georgia Aquarium functions as a world-class destination while fulfilling its nonprofit mission of education and conservation. PGAV’s background enabled its team to understand and serve the needs of the animals as well as the guests, and to understand and collaborate with the scientists. Vision (with the mandate for a “wow” factor) and principal funding came from Home Depot founder Bernie Marcus, as a gift to the city and people of Atlanta. Annual attendance is reported at some 2.4 million and at the time of opening, the facility was named World’s Largest Aquarium in the Guinness Book of World Records (now surpassed by the aquarium at Chimelong Ocean Kingdom, also designed by PGAV), with tanks of more than 10 million gallons, more than 100,000 animals and building area of 7,800 square meters on a 13-acre campus. Accolades include a TEA Thea Award for Outstanding Achievement, high rankings by TripAdvisor and the Atlanta Downtown Excellence Award for Outstanding Community Project. Bruce Carlson was one of the original core team who worked with Marcus from the early stages and continued on to manage the aquarium after opening. He retired in 2011. Said Carlson, “Bernie wanted a world aquarium. While many aquariums focus on their local ecosystems, our challenge was how to tell an international and biologically-diverse story. In addition to animal and water displays, there would be a theater, gathering spaces, administrative offices, parking, etc. PGAV was there to help take the concept ideas and make them more definite, distinct, and exciting. Two key elements of the guest experience at Space Shuttle Atlantis: 1) positioning the shuttle with the doors open as if it were moving through space; 2) the breathtaking, “big reveal” of the shuttle that forms the transition from the media-rich pre-show to the media-rich floor of interactive exhibits. The $100 million, 90,000-square-foot exhibition features four multimedia and cinematic productions and more than 60 interactive experiences that invite guests to imagine themselves as astronauts – and to celebrate the people, passion and patriotism behind the shuttle program. Accolades recognizing the design work include a Silver Muse Award from the American Alliance of Museums, the Annual Communicator Award of Excellence by the International Academy of Visual Arts, for Interactives; and the Merit for Signage, Wayfinding, and Environmental Graphics from the HOW International Design Awards. Working closely with primary stakeholders Delaware North Companies Parks & Resorts (operators of the visitor center) and NASA, the PGAV team approached the creative challenges with customary relish. “We became huge space geeks,” said Howard, who served as project manager. 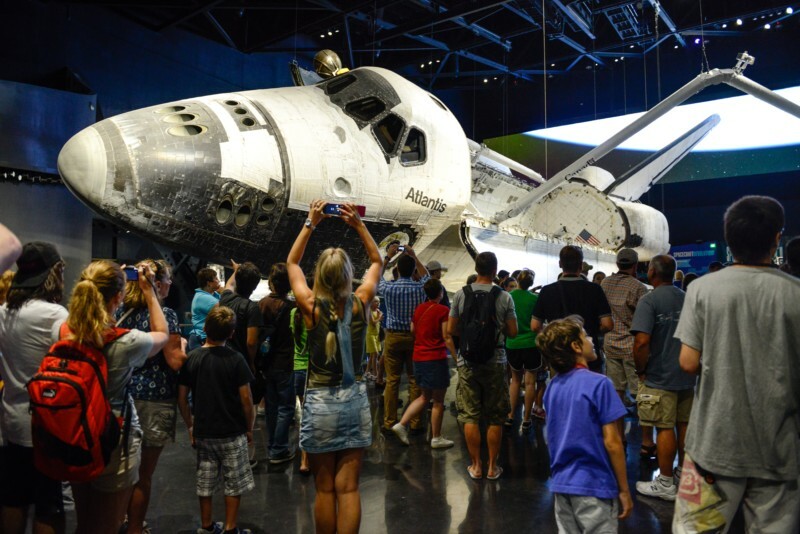 Amanda Yates, lead designer, brand experience, wrote “Becoming a Space Geek: Designing for Space Shuttle Atlantis” in the PGAV Blog (June 2013): “Passion for the subject matter is absolutely essential to the work we do at PGAV. As destination designers and storytellers, we must become immersed in the narrative. For the home of the Space Shuttle Atlantis, we had amazing source material: three decades of missions, amazing imagery, thrilling stories. We had the real-deal, space-flown orbiter Atlantis.” The orbiter, which Kennedy Space Center obtained in a competition when NASA ended the shuttle program, is the centerpiece of the main exhibit area. The main floor is filled with interactive displays; some share historic information and images, and some are hands-on challenges. The new-minted space geeks of PGAV did their homework. “We dug in,” wrote Yates. Owen said, “It was both fun and challenging having to work with a big team, on a big team effort, to trust each other, to help everybody do their best work and end up with a great product for visitor and client and for NASA.” The Center reported a 25 percent annual attendance jump in the first year. Mike Konzen recently shared these in a presentation at the 2017 IAAPA Leadership conference.